ASHRAE 90.1-2007 is the primary document for establishing the BASELINE BUILDING PERFORMANCE standard for the whole building energy simulation. The baseline building performance is the annual energy cost for a building design intended for use as a baseline for rating above standard design. An energy simulation model, or energy model, is a computer-generated representation of the anticipated energy consumption of a building. It permits a comparison of energy performance, given proposed energy efficiency measures, with the baseline. ASHRAE 90.1-2007 is continually updated through approved addenda, which are regularly posted on the ASHRAE (American Society for Heating, Refrigeration and Air Conditioning Engineers) and IESNA (Illuminating Engineers Society of North America) websites. The purpose of the document is to provide minimum standards for energy efficient buildings for both new and existing buildings. 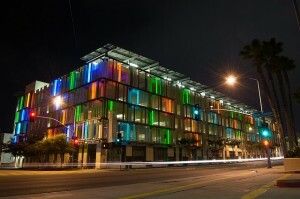 The baseline building performance is used establish the minimum energy performance requirements for a LEED project. To meet the LEED Energy and Atmosphere Prerequisite 2 – minimum energy performance, buildings must demonstrate a 10 % improvement (5% for existing buildings) in performance rating compared to the baseline building performance rating. The goal is to establish the minimum level of energy efficiency for the proposed building and systems to reduce environmental and economic impacts associated with excessive energy use. The building is to be designed for compliance with Mandatory Provisions AND Performance Requirements (which are listed for specific types of equipment for water heating, heat rejection, etc.) OR comply with Prescriptive Requirements (outlined below). 9.2.2.1 The Building Area Method for determining the interior lighting power allowance, described in Section 9.5, is a simplified approach for demonstrating compliance. 9.2.2.2 The Space-by-Space Method, described in Section 9.6, is an alternative approach that allows greater flexibility. lighting power allowance among portions of the building for which a different method of calculation has been used are not permitted. The installed interior lighting power identified in accordance with Section 9.1.3 shall not exceed the interior lighting power allowance developed in accordance with Section 9.5 or 9.6. Exceptions: The following lighting equipment and applications shall not be considered when determining the interior lighting power allowance developed in accordance with Section 9.5 or 9.6, nor shall the wattage for such lighting be included in the installed interior lighting ANSI/ASHRAE/IESNA Standard 90.1-2007 (SI Edition) power identified in accordance with Section 9.1.3. However, any such lighting shall not be exempt unless it is an addition to general lighting and is controlled by an independent control device. a. Display or accent lighting that is an essential element for the function performed in galleries, museums, and monuments. b. Lighting that is integral to equipment or instrumentation and is installed by its manufacturer. c. Lighting specifically designed for use only during medical or dental procedures and lighting integral to medical equipment. d. Lighting integral to both open and glass-enclosed refrigerator and freezer cases. e. Lighting integral to food warming and food preparation equipment. f. Lighting for plant growth or maintenance. h. Lighting in retail display windows, provided the display area is enclosed by ceiling-height partitions. i. Lighting in interior spaces that have been specifically designated as a registered interior historic landmark. j. Lighting that is an integral part of advertising or directional signage. l. Lighting that is for sale or lighting educational demonstration systems. m. Lighting for theatrical purposes, including performance, stage, and film and video production. n. Lighting for television broadcasting in sporting activity areas. p. Furniture-mounted supplemental task lighting that is controlled by automatic shutoff and complies with Section 9 A.IA(d). What guide lines are used under Lee’s for electric baseboard heat ? Do you mean LEED? it would depend how the overall performance vs a baseline code building. There are two methods prescriptive and performance based on ASHRAE’s 90.1, also would depend what type of building it is. usually electric resistance is least efficient way to heat.